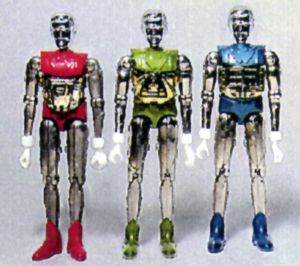 There are three known variations of these figures: in the color of the capsule, it's decal and the figure's shoes. Shown below are two capsule variations. 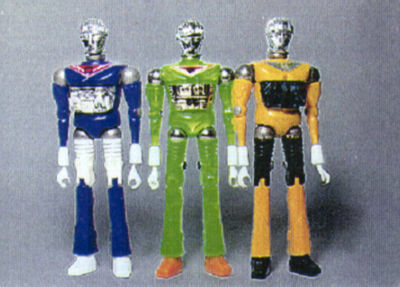 This series of figures was released in tandem with the M11X series, and has the same variations, which are also shown below. 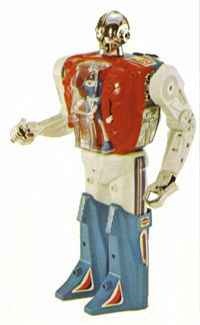 This is the first Acroyear figure, though it's Micronauts equivalent (Acroyear II) was the second Micronauts Acroyear. Acroyear has large bowling ball-like fists. 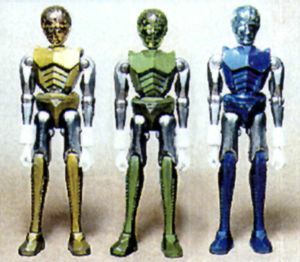 They are identical in all respects to Micronauts Acroyear II. Released in early 1975. 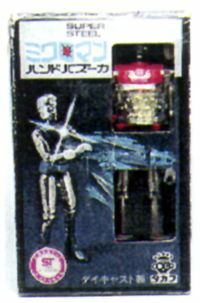 One of the few 3" figures to be released in a cardboard box rather than a plastic capsule. The earlier version of the M22X series. It is different from that series in the length of the wrist cuff and the fact that it has no peg hole in it's back. 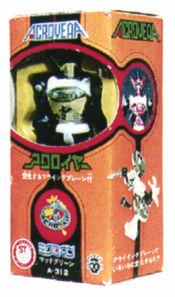 Robert is also found in a metallic green and gold version. 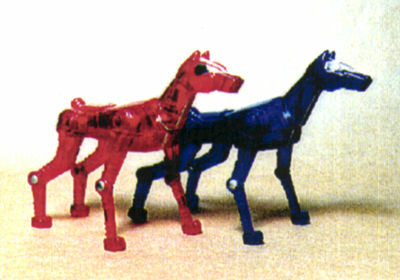 These figures were released in black capsules. 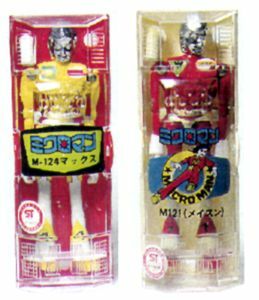 Another difference between the M20X and M22X series is that the chest plates on the M20X series project away from the stomach. 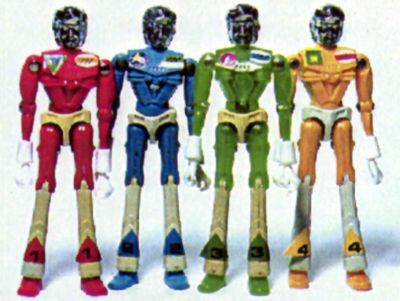 These are die-cast figures. 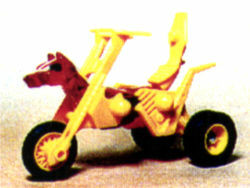 Corresponds to Space Glider in the Micronauts line. It was released with a helmet and "dash" wing. 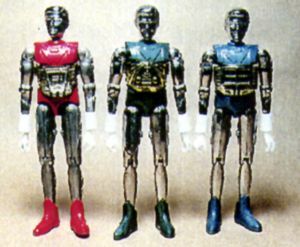 There are some Microman examples which have a helmet whose color corresponds to the torso color of the figure, but most came with a blue helmet. 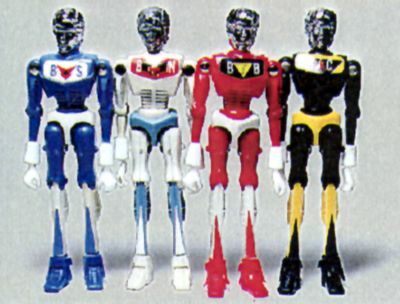 Die-cast. 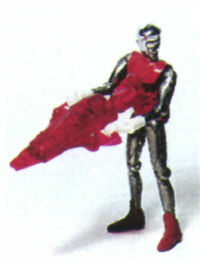 This is a 3" Robotman, which we know as Biotron. 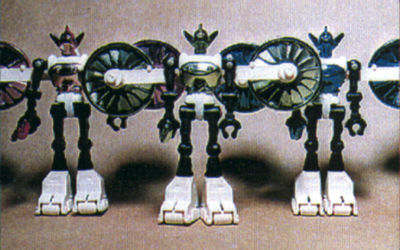 Can you imagine having a small Biotron to go with your Time Traveler when you were a kid? Well, if you lived in Japan you could! 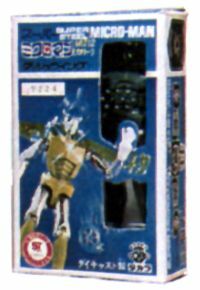 This is one of the hardest figures of the original Microman line to find, and he commands a high price when he changes hands. Comes in unexpected color combinations, also, like green and greenish black. 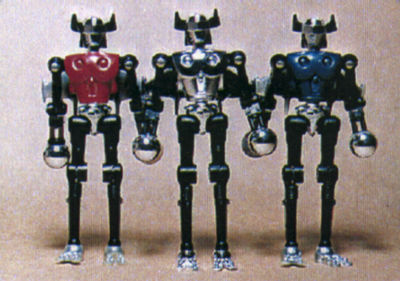 Corresponds to Galactic Warrior in the Micronauts line. 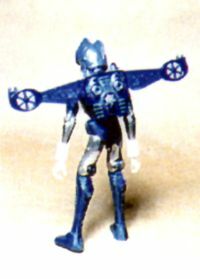 This figure differs from the M20X series in the length of the wrist cuff (which became the standard), the peg hole in back, and the addition of a huge "bazuka" or bazooka that attaches to the stomach. Die-cast. 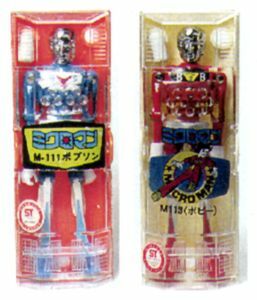 The much more formidable Microman Acroyear II, the Micronauts Acroyear. 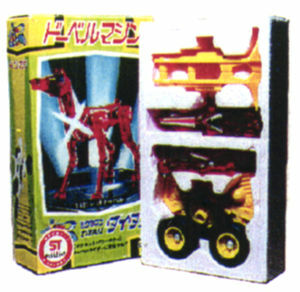 There is debate as to whether or not this figure was released simultaneously with Acroyear I, but the design improvements would suggest that it was released after Acroyear I. Most likely released in late 1975. Titan. 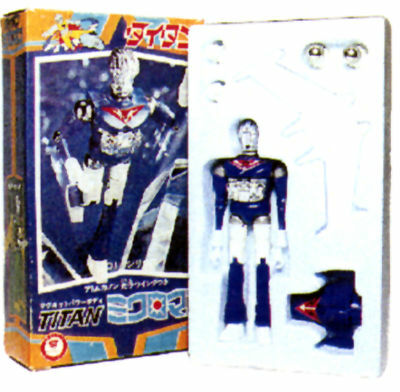 This is the first and most sought after Titan figure. 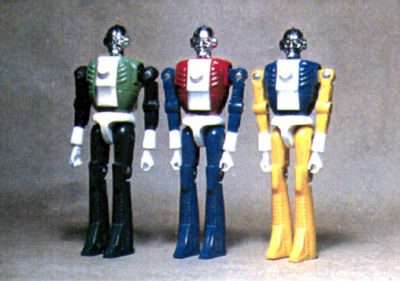 It was released in 1975, has a chest plate similar to Time Traveler and stands slightly taller than the basic Microman. 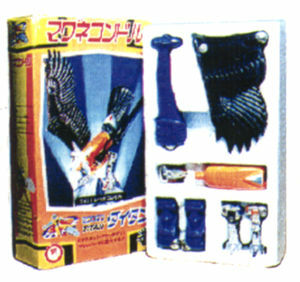 It is Magno-powered and came with a large set of wings reminiscent of those of Microman Acroyear II. Also came with a chest cannon. 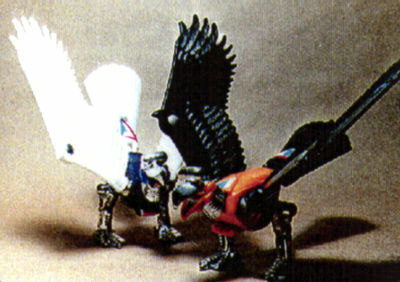 This is the Magna-Condor, and as you can guess from its name, it is magna-powered. Designed to be an animal sidekick of the Titans. 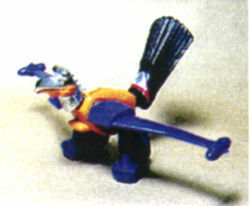 It's wings are removable and can be replaced with rocket wings. It's feet can also be removed and replaced with plane-like landing gear. The parts fit the Titan's body, so a child could put wings on his Titan if he wanted. Released in tandem with the T40X figures above. How many times have you been walking your dog and wished you could convert him to a motorcycle and ride away? Well, with a Red or Blue Dober, you could! He is also magno-powered, and when his limbs are removed, you can replace them with tricycle parts. Titan's best friend!